Heavy rain and storms soaked the D.C. area Tuesday, leading to flooding that trapped several people in cars and businesses; a partial road collapse in Northern Virginia and a D.C. school closure Wednesday. Eliot-Hine Middle School in Northeast D.C. is closed Wednesday due to flooding in multiple areas of the building. Water began trickling into the building during Tuesday afternoon's heavy rain, causing teachers to move students to drier areas in the school. As the rain continued, the flooding got worse, leading officials to cancel classes Wednesday. Officials said contractors are assessing water damage and making repairs. Students in need of a hot meal were able to receive one at Eastern High School. Heavy Rains Flood Roads, Trap Cars in Prince George's Co.
Cars are getting caught in flash flooding accross Prince George's County. Remember: If you can't see the ground, turn around. 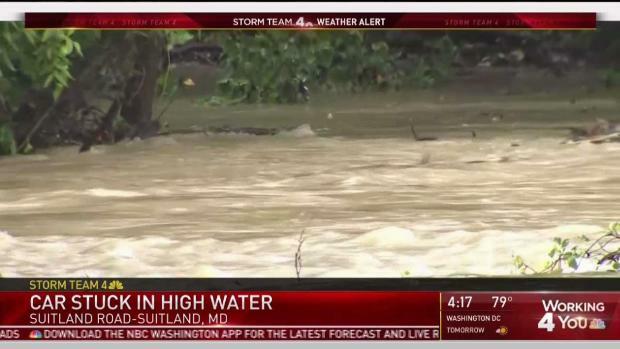 News4's Tracee Wilkins reports from Suitland Road. Several local roads were closed due to the flooding. In Loudoun County, a portion of Stumptown Road in Waterford collapsed and remains closed. Fairfax County had several roads closed due to flooding. Most have reopened, but a few areas in the Mason District remained closed as of midday Wednesday. Go here to see a list. A flood warning expired late Wednesday morning for several areas in Maryland and Virginia, although a warning remained for Berkeley, West Virginia, where several roads remain closed. Schools there were set to open two hours late due to the flooding, officials said. Although most of the D.C. area is dry, a few areas around Fauquier County and Culpeper were seeing rain lingering around midday Wednesday. Temperatures should reach the mid-80s, and the humidity will drop in the afternoon. The dog days of summer are coming to an end in the D.C. area. The rest of the week is expected to feel more like fall. Sunny, clear skies are expected to reach the area by Thursday. The weekend is expected to be pleasant and sunny, with temperatures in the mid-80s. Tornado warnings were briefly in effect for Allegany and St. Mary's counties, Maryland, on Tuesday. Those warnings expired. It wasn't immediately clear if tornadoes touched down or if radar just indicated they were possible. In Prince George's County, fire officials reported that eight people were rescued Tuesday from a business on Old Ritchie Road after the building flooded. At least four people were rescued from stalled vehicles in the same area. More were rescued in Capitol Heights.